Category: Reincarnation - Hygeia Healing for Body, Mind and Soul. The following was written by Wes Annac for the eighty-sixth issue of The Aquarius Paradigm Weekly Newsletter. To begin for this week, I’d like to talk about reincarnation. Some seekers might not think reincarnation’s very important to our evolutionary process, but the things we’ve been told about it by our discarnate fourth-dimensional sources are very interesting and worth our attention. Even though we’re believed to be moving off of the reincarnation cycle, we might as well learn as much as we can about it and the endless other spiritual concepts we’ve been presented with. Why not deepen our understanding of reincarnation and anything else that might not seem important at first glance? Thanks to the material we’ve been given, we have a clear understanding of reincarnation’s role in helping us resolve our karmic debts. Some of the fourth-dimensional souls who’ve spoken with humanity through mediums still have third-dimensional lives to experience, and when the body dies, our stay in the spirit realms can be temporary depending on our karma. Some people choose to reincarnate after reaching the spirit realms and gaining a new perspective on the karmic debts they’ve occurred in life, whereas others automatically reincarnate if they just can’t handle the fourth dimension. We’ll begin with two quotes from Silver Birch, who tells us that we’ve played every role there is to play on the earth. We’ve incarnated as rocks; grass; animals; humans – the list goes on. We’ve experienced life in every way we possibly can, and even still, most of us have a lot of learning to do before we can leave the earth behind. When we’re ready, we’ll happily move beyond the third dimension and into a much more liberated state of consciousness. A spirit communicator named ‘Stephen’ tells us about the endless amount of lives we’ve experienced on earth. “Everyone of you has lived ten thousand times ten thousand lifetimes in the physical plane. (…) Those who go around playing the reincarnation game, saying that they know this is going to be their last incarnation and that they have completed their evolution are very foolish. We should keep in mind that this material was probably given far before our current time, and with our evolution impending and ongoing, I’m sure plenty of us will be able to complete the karmic cycle and discover what the other side has to offer. Even when we complete this cycle and ready ourselves to move into a higher state of consciousness, the drive to help others evolve will probably be unavoidable. With the intense compassion fourth-dimensional souls are tasked with balancing, it’s probably difficult not to want to help the lower dimensions in any way one can. It’s been said that the fifth dimension resolves the intense compassion most souls gain in the fourth (which is where we go when the body dies) but the drive to be of service is probably overwhelming in earth’s fourth-dimensional realms, especially because of the amount of pain and destruction this planet offers. Arthur Ford tells us that our perspective is different each time we pass into Nirvana. Our perspective is different every time we reenter spirit, and this is because of the new things we learned as we took on a different identity from our previous incarnation. It’s important to monitor our thoughts and actions in every incarnation, because in spirit, we’ll experience exactly what we created with our thoughts in the third dimension. If we recognize the errors we’ve made and make amends, by the natural laws of karma and grace our slate will be wiped clean. Source is all-loving and would never seek to make us pay more karmic debt than we’re meant to, and he/she is ready for us to return to an undistorted state of consciousness – even if it’s only for a moment before we make our lower-dimensional sojourn again. T.E. Lawrence tells us that his eventual reincarnation will be inevitable because of the heavy karma he still has to experience. “I begin to feel that my present dilemma [with regard to his awareness of mistakes made in his earth life] is only to be resolved rightly in light of the legacies of my past lives. Reincarnation assures me, in relation to the first two of my difficulties, that I shall meet again those who have been injured by my deeds in a future which will itself contain modifications due to my interference with the pattern, so that in two ways I shall again come to grips with my own evil and be given another chance to wrestle with it. People who’ve made big mistakes on earth are given as much time as they need to remedy them in spirit, but for some, meeting back up with the people they’ve harmed inevitably entails reincarnating. Our actions are more important than we think, and if we aren’t careful, we might have to re-experience the third dimension to remedy any mistakes we make. Eventually, we will be able to exit the karmic cycle, because we’ll have remedied any and all errors and wiped our slate clean. In doing so, we’ll be able to greet the higher state of consciousness that so many of us hunger to feel and remember again. Lawrence then tells us that his stay in Nirvana has reinforced his understanding of the importance of reincarnation. I’m sure the necessity to reincarnate is understood when one gains a perception of the karma they still have to work through. Especially if one’s hurt people in their previous lives, it seems that reincarnating to go over the lessons they plan for themselves is inevitable. Reincarnation is probably desirable when the slow progress of growth off the earth becomes painfully obvious, and a lot of souls are probably very excited to give rapid earthly learning another try. Julia Ames tells us that our oversoul remains in the higher dimensions while fragments of it incarnate on the earth for growth and learning. “Not more than a fractional part [of us] is dipped into matter for purposes of education and of tempering. If you could imagine a wheel with many spokes and each spoke capable of being detached and heated to white heat and hammered on an anvil until it was fit to take its place in the perfect wheel, you can form some idea of reincarnation. We help the oversoul gain insight and clarity with our actions here on earth, and when the time comes, we’ll be able to merge with our higher selves and feel the bliss of a completed lower-dimensional experience. Ames also tells us that she isn’t undergoing any fragmented lower-dimensional lives, but the person she’s speaking to (and plenty of others) have experienced thousands. Some higher-dimensional souls have completed their fragmented journeys and no longer need to incarnate on the earth, but obviously, plenty of others continue to learn and grow here. It’s been said that our guides aim to help everyone evolve from the third dimension this time around, and I think a lot of progress will have to be made for this to happen. In our final quote, Ames tells us more about our separation from (and reunion with) our higher selves. “Sometimes the spokes are rejoined to the hub for a season, sometimes there is more than one spoke incarnate at the same time. The problem of existence is infinitely more complex than you or I thought. But this is sure. The personality in its ultimate is one and indivisible. Eventually, we’ll be able to reunite with the Godsparks that make up the same entity of consciousness we make up, and a grand reunion of all of our individual ‘selves’ will take place as we all realize that we’re one. Eventually, all of humanity will be able to open up to our oneness with each other, and when this happens, we’ll be able to come together on a soul level. Reincarnation is a deep and interesting subject that we’ve really only scratched the surface on, and even though I’ve been saying this in a lot of articles, I’ll probably continue writing about this subject next week. In my view, it’s exciting to understand the concepts we’ve been advocating for so long in a deeper way. Isn’t learning great? Doesn’t it feel good to learn about the realms beyond and our earthly incarnation cycle? When we reach a higher state of consciousness, a lot of things we can barely touch now will be seen and known from a greater perspective and we’ll easily understand the concepts we’ve rigorously researched. Here’s to a lifetime of spiritual knowledge! Footnotes:(1) Silver Birch, Teachings of Silver Birch. Wisdom from the World Beyond. Ed. A.W. Austen. London: Spiritualist Press, 1962; c1938, 48. (3) Robert Leichtman, The Psychic Perspective. Columbia: Ariel press, 1978, 242. (4) Arthur Ford through Ruth Montgomery, medium. A World Beyond. New York: Fawcett Crest, 1971, 16. (5) T.E. Lawrence through Jane Sherwood, medium, Post-Mortem Journal. Communications from T.E. Lawrence. London: Spearman, 1964, 89. (7) Julia [Julia T. Ames] through W.T. Stead, medium, After Death. A Personal Narrative. New York: George H. Doran, n.d.; c. 1914, 189. 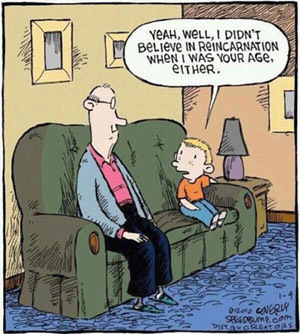 This concludes this week’s reincarnation discussion.